For four centuries members of the clergy, as well as citizens of Palermo, have been buried in the Catacombe dei Capuccini. These passageways are open to the public. For those of you that are too afraid of skeletons, I would recommend you to visit one of the many other sights Palermo has to offer. For those with no such fears, visiting this necropolis is by no means a scary experience, but gives you a whole new perspective to life and death. In 1590, the Capuccinis, a branch of the Franciscan order, had grown out of their cemetery and started to dig catacombs, subterranean passages, to bury their dead. We decided to visit these catacombs, and we were truly in for a fascinating experience. We descended into the catacombs through a gateway. They are wide and tall enough, so you will have no difficulties walking through them. Alongside, and separated by fences, you can see up to 400 year old corpses. Some of them are embalmed and life like, others are mere skeletons. Remains of the clergy are dressed up in their brown robes, carrying ropes, as symbol of penance. 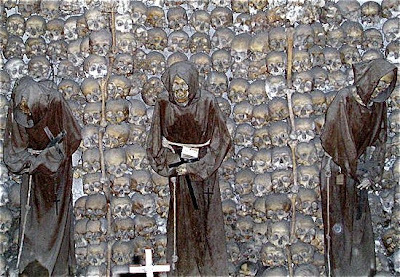 Seeing these skeletons dressed as friars is certainly a powerful experience. 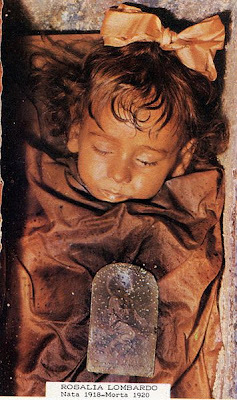 One of the main attractions is the life-like body of Rosalia Lombardo. She was one of the last people to be buried here, and died December 6th 1920, only two years old, of pneumonia. Rosalia's father was so heartbroken from the loss of his little daughter that he asked a famous enbalmer, Dr. Alfredo Salafia, to preserve her for the past. She rests in the catacombs, and after 90 years, she looks like she is sleeping. How Dr. Salafia managed to preserve her in this state, is still a mystery. Seeing Rosalia is a touching experience. For those of you, that think the photos here are taken of us, think again. We have copied this from wikimedia. Taking photos in the catacombs is strictly forbidden, and we would never have dreamt of disturbing the dead in that way. Still we saw tourists that took pictures, and we thought it disrespectful. So to those of you that visits these narrow passages – see and feel, but respect the dead!